The San Diego Section of The Society of Naval Architects and Marine Engineers held its January meeting at the Sheridan Harbor Island Hotel in San Diego. Michael L. Steine, manager of marine marketing for the Tano Corporation, presented a timely paper titled "An Approach to Plant Automation for American Ships of the 1980's—The Ingram Class System." The current energy and economic realities that have affected the typical ship designs have also impacted the design of the machinery plant automation system. This paper described the Ingram Class ships, with emphasis on why this ship d e s i g n reflects some of the current and anticipated plant automation trends for the United States. Data was Simultanoffered to correlate ship system and automation system requirements. Trends addressed included the apparent demise of steam propulsion, the ascent of the slowspeed diesel, the use of periodically unattended engine rooms, and the fitting of simpler and more reliable plant automation systems. 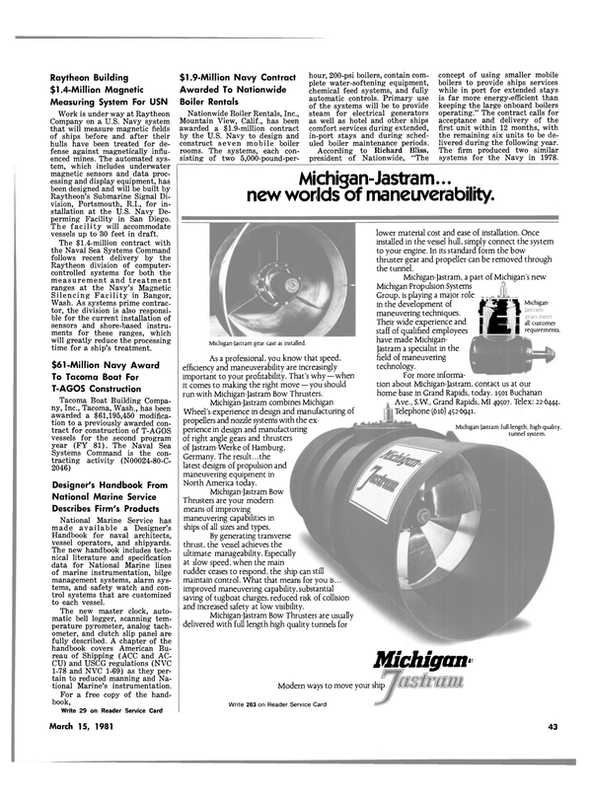 The paper concluded by emphasizing that simpler, leaner, more economical, and more maintainable automation systems like the system being provided for the Ingram Class ships should become the most prevalent type of system for new U.S. ships throughout most of the decade of the 1980s. Some 60 members and guests in attendance concluded the meeting with a question and discussion period. the folder shows the cost efficiencies of shipping containers by barge from five river ports, terminating at the Port of Portland for transoceanic movement. Traffic on this clear, 14-foot channel has increased twentyfold in just three years. The six cooperating ports are: Port of Lewiston (Idaho) ; Port of Whitman County, Port of Clarkston and Port of Pasco (Wash.) ; Port of Umatilla and Port of Portland (Ore.). Current rates, facilities and services of all these ports are included.